From the depths of his parent’s garage, Alistair MacLellan spends hours meticulously crafting handmade notebooks under the moniker MacLellan Baetz Publishing House. Alistair has been designing and building things since he was a child. “My whole life I have used notebooks to brainstorm ideas and one day I deconstructed a notebook to see how it was made,” he said. “I then became obsessed with making my own notebook.” Thus MacLellan Baetz Publishing House was born. After a lot of trial and error, he showed a decent-quality prototype to a few people; impressed, they were keen for Alistair to make one for them. After he figured out how to consistently replicate a good notebook, he launched a Kickstarter campaign to see if there was an appetite to support this idea as a small business. He reached his campaign goal in three days and his parent’s garage has been his book-making headquarters since 2014. The books come in three sizes and three colours, although Alistair is always up for a custom design. The paper is from an American company that offers a great and versatile writing experience, regardless of the instrument you use: pencils, pens, markers or fountain pens. (Pro tip: Alistair uses a Sharpie pen with great success). Each book can take up to two hours to make, but with an increase in demand, he is making several at one time, which speeds up the process. “The most challenging part of the entire process is waiting for things to dry,” he says. Channeling his inner patience and managing his frustration when he messes things up is slowly getting easier. Being handmade, each notebook is special. They are based on the same base design but he says he each notebook comes with its own personality, like a favourite pair of jeans or shoes. “The more you use it, the more its personality becomes apparent,” he says. Part of the notebook’s charms is that it’s made locally so you get to talk to the person who created it. He has shipped notebooks all over the world but is very passionate about being part of the thriving community in Waterloo Region. And being a local maker means it is easier for him to honour his fix-it rule if a notebook gets damaged someway. “I like to think I am not just building a product but also community around that product,” Alistair says. Interest in his books is growing and he is hoping to ramp up production to 8-10 notebooks a day to meet demand. He also has lots of grand ideas for expanding his publishing house: a personal agenda; a how-to guide for making your own notebooks; as well possible fiction and non-fiction printing. As a self-professed typography nerd, he is also at work on creating his own typeface. But none of these things diminish his quest to make the perfect notebook. You can see what the books are like and meet Alistair this Saturday, at the Stitch and Kitsch in Uptown Waterloo (11am-5pm). If you can’t make it, ordering books from his site is easy. I did it and love my red notebook. P.S. Alistair’s favourite topic of conversation: What are you eating? Where did you get it? Can I have some? I love to look at a wall full of colourful yarns, run my fingers over the skeins, admiring the softness and texture while dreaming about what delightful creations I could knit, if only I made the time (and had the talent). 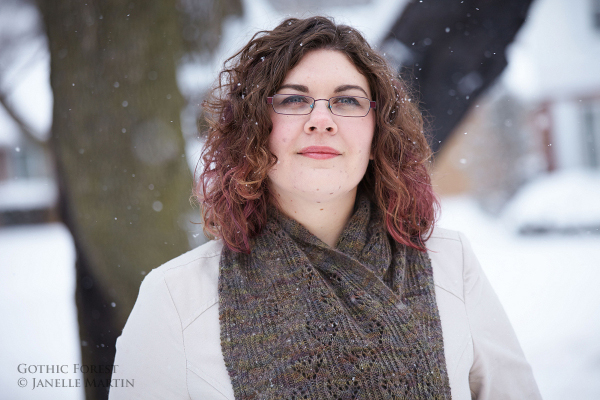 Then there are people like Kitchener`s Janelle Martin who take yarn admiration to the next level, and not only knit gorgeous things but create intricate patterns to showcase the richness and beauty of the wool. The bonus is people get to look fabulous in her creations. 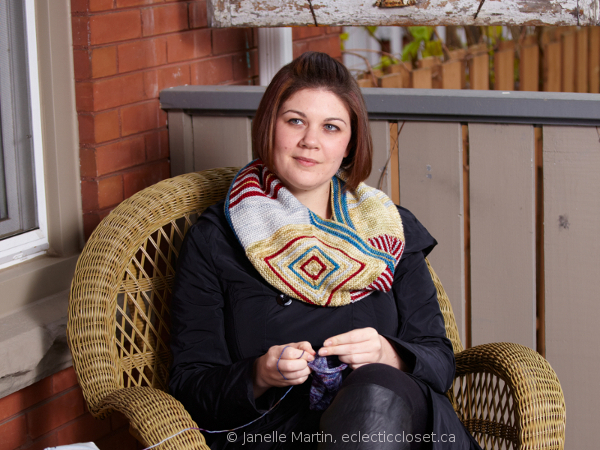 Meet knitting instructor and pattern creator, Janelle Martin, the mind (and fingers) behind eclecticcloset.ca. For Janelle, pattern creation is more than the end result; it’s about creating organic, creative designs that start as a blank canvas and become a colourful and textured piece of art. I had a chat with the knitting maven Janelle, who aside from her knitting projects also reviews books and manages strategies to support community mapping and sustainable economies. What’s the best thing about knitting? It makes me a more patient person! It relaxes me and allows me a creative outlet. Plus, it uses both sides of my brain at once, so anything I learn while knitting I tend to remember in great detail. And at the other end of those miles of yarn comes something you can wear. It’s also social – there is a whole sphere encompassed by knitting. Knitters flock to one another and when we meet each other, we automatically have something to talk about. I traveled around New England in October visiting yarn shops and promoting my designs (you can see posts on my blog about the trip). Even though I was traveling alone, I never felt lonely because I spent each day meeting knitters and yarn store owners. How many attempts do you need to make a pattern ready to publish or sell? Some designs flow out of my head, onto my needles and then to the printed page without any bumps. Others take a year or more to have them ready to publish or sell. My Flower Bell Stole is one that went back to the drawing board multiple times. I love using Japanese stitch patterns and this design features several, but the ones I used in the first version “ate” yarn and so I had to go back to the drawing board and rethink part of the design. I’m pleased with the final version but it is different than the original I had envisioned. What inspired you to make your own patterns and publish them? It started as a challenge just to see if I could do it. I had never really thought of myself as creative but I was always drawn to collage work and I think designing knits is closest to this process. I start with my `blank canvas` by choosing the shape of the piece I want and then I combine stitch patterns to create the texture upon that canvas. The exciting part is creating organic designs. I like there to be continuous lines in my work, for the stitch patterns to grow out of each other. Often this means I have to create transition charts to move from one stitch pattern into the other. My complex lace designs, such as Cartouche Shawl had five or six charts to handle these transitions, but the result is worth it. Tell me about the knitting classes you teach at Shall We Knit? As a guest teacher at Shall We Knit?, I teach advanced beginners and knitters interested in learning new techniques. One of my favourite classes to teach is on intentional pooling. Ask anyone who has knit with hand painted yarn, it can sometimes pool (the stitches of the same colour stack up near each other over several rows) and create blotches of colour in the knitted fabric. With intentional pooling, the knitter takes advantage of this and uses calculations and adjustments in tension to get the colours to line up in vertical stripes. It takes a bit of work but produces stunning effects. I’ll be teaching this class in April at the Knitter’s Frolic in Toronto (spots are still available) and in August at the Lancaster Yarn Shop in Pennsylvania. Is your blog a forum for your patterns as well as your other hobbies, such as your book love? I started the blog in 2005 when I was reviewing books for several online review sites. I mainly focused on literary fiction, mysteries, non-fiction about social issues and of course, knitting books. As I began designing, my blogging seemed to decrease. I do want to get back to book reviewing again, but that won’t seriously happen until I finish graduate school in a few years. For now, I promote my designs, post things that catch my eye, and occasionally post about my garden. I love literary fiction, British literature, mysteries and fantasy/science fiction. Recently I’ve been reading a lot of fantasy as I wait for the next season of Game of Thrones to start. I just finished Jeeves and the Wedding Bells, Sebastian Faulks` fantastic homage to the works of P.G. Wodehouse and A Feast of Crows by George R.R. Martin. Any plans for a knitting pattern book? Not right now but it is something I think about. I think the first step would be a mini-collection of 4 or 5 designs released together. A number of designers are creating some interesting work like this and I have few ideas coalescing. What is your favourite wool to work with? For merino, my favourite is independent dyer Indigodragonfly’s yarns. Kim McBrien is a textile artist based in Haliburton who has an amazing sense for colour, a wicked sense of humour and a love of geekitude that shows up in her crazy colour names that give nods to popular culture like Doctor Who, Buffy the Vampire Slayer and Downtown Abbey. 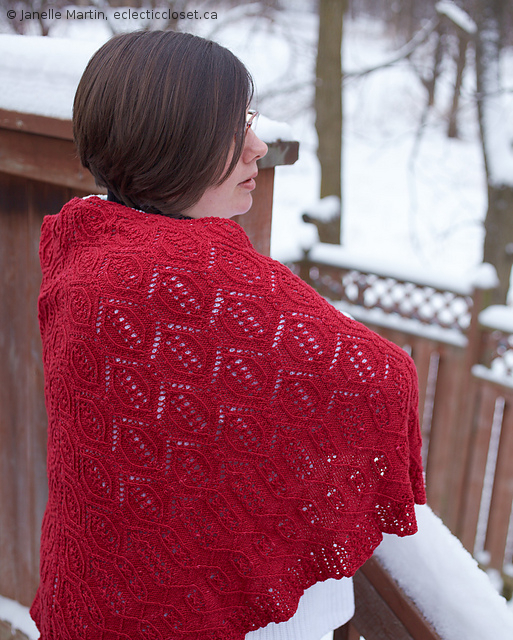 I’ve designed several patterns using her yarns including my most recent release Sargaço Shawl. And then there’s cashmere…such a lovely fibre to use. Tabi Ferguson, owner of Sericin Silkworks is a local spinner/dyer who sells luxury fibres. My scarf pattern Gothic Forest was knit in one of her gorgeous cashmere yarns. Any advice to beginning knitters? Knit with yarn you love to touch and don’t be afraid to try new things. And take as many classes as you can. I still take classes from teachers I admire because I always pick up a new tip or a different way of doing something. 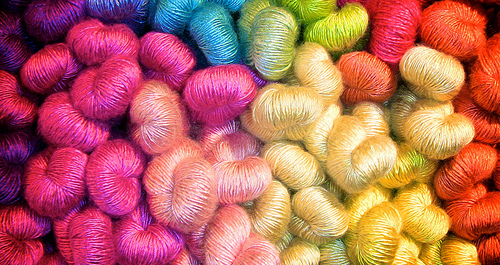 Spend some time on Ravelry – it’s the best resource for knitters on the web. We all make mistakes; don’t let yourself be discouraged by them. Just keep knitting! What else do you like to do in the arts-culture world? I enjoy the Stratford Festival: we’re so lucky to have it on our doorstep. 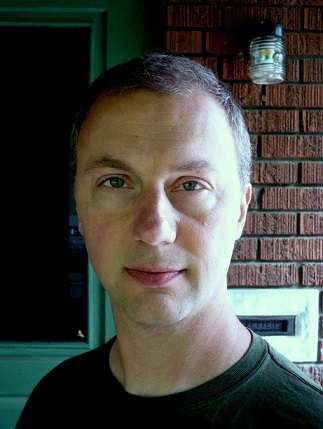 I also have friends involved in the Kitchener-Waterloo Comedy Festival (March 6-8) and Words Worth Books brings in some great authors for readings. 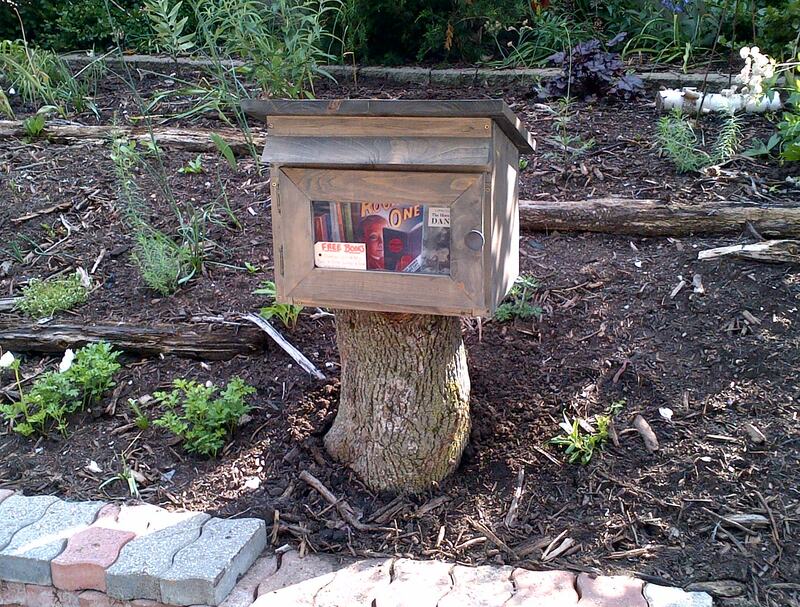 I also have a Little Free Library in my front yard at kid height, filled with children`s books. There is nothing better than seeing the neighbourhood kids stop and pick up a book. 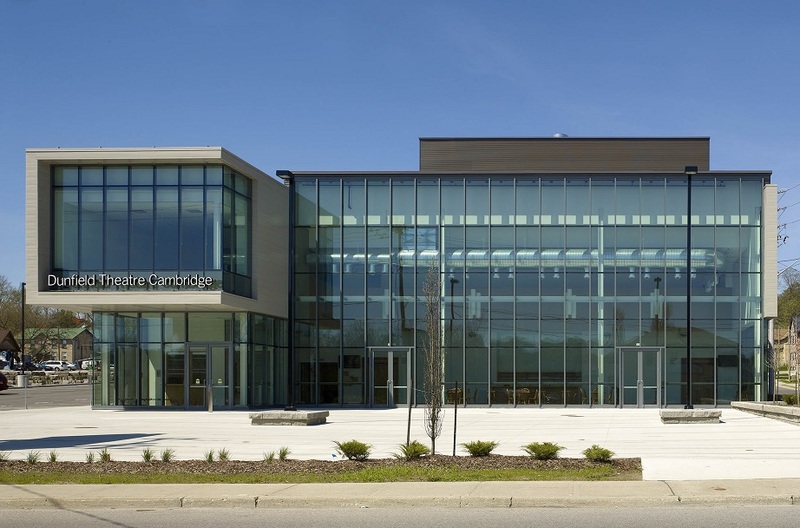 Do you have a wish for Waterloo Region? My biggest wish is that the region focuses on becoming more sustainable. My favourite quote on the topic is from Julian Agyeman, Robert Bullard and Bob Evans who describes the urgency for sustainable cities as “the need to ensure a better quality of life for all, now and into the future, in a just and equitable manner, whilst living within the limits of supporting ecosystems.” My hope is that this region will someday lead the way in sustainability. You can keep up with Janelle and her busy needles on her blog or raverly. 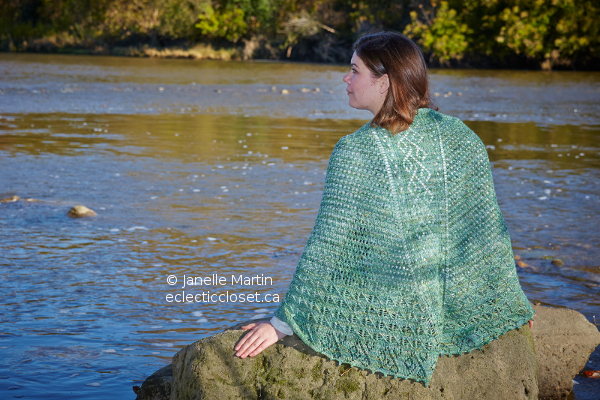 Janelle was recently nominated for a 2014 Arts Award Waterloo Region in the category of textiles. Good luck Janelle. Books and literature: what have you read lately? 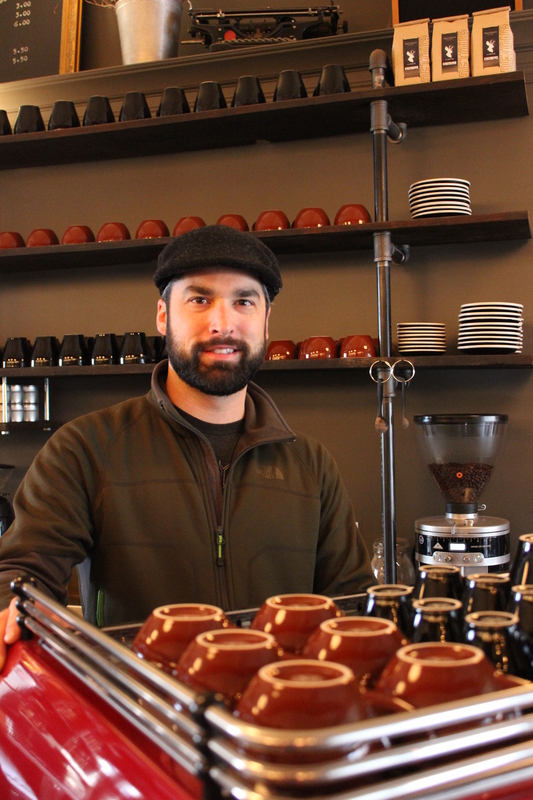 Nestled into the edge of Uptown Waterloo, sits a whisky and espresso bar called Death Valley’s Little Brother (DVLB), owned by husband and wife team, Joel and Katherine Gingrich. 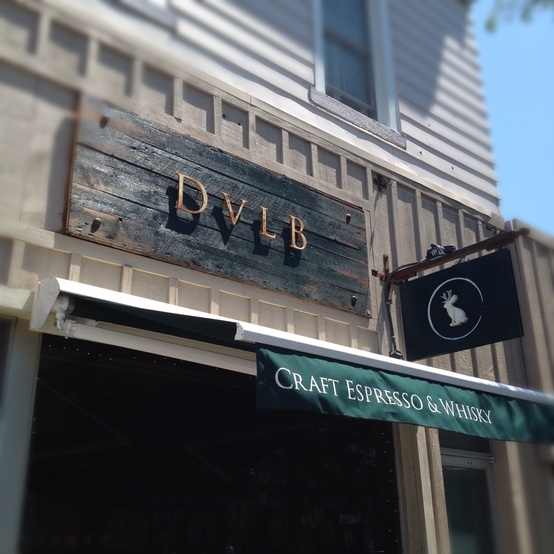 From the intriguing jackalope image on the front window, to the industrial, reclaimed tables, to the size of glasses used, every element in DVLB’s design is intentional, without being contrived or pretentious, and really rather cool. “The idea for DVLB was inspired by people who take chances on new ideas; places where we’ve seen authenticity and originality in play,” says Joel. “To step out onto the ledge with a new idea takes trust that your idea is authentic.” At DVLB they wanted to do two things really well: espresso and whisky, while offering a warm, low-key place to enjoy conversations and good music, often played on a record player or on their slightly out-of-tune piano. The art on display changes frequently and Joel is opened minded about what goes up. “The only filter I use is if it will work well in the vibe of the space: paintings of homicidal maniacs would definitely ruin the vibe we’ve created,” he says. P.S. 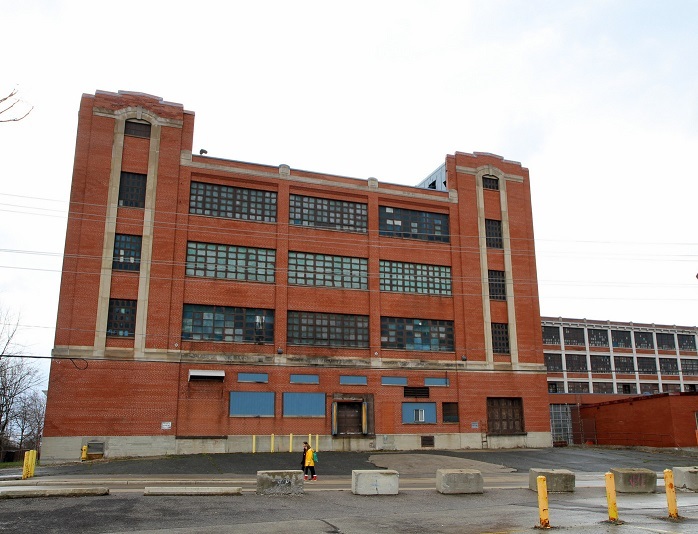 Joel’s favourite topic of conversation: envisioning a future where the LCBO doesn’t get to be the final arbiter on what products we can buy. P.P.S. 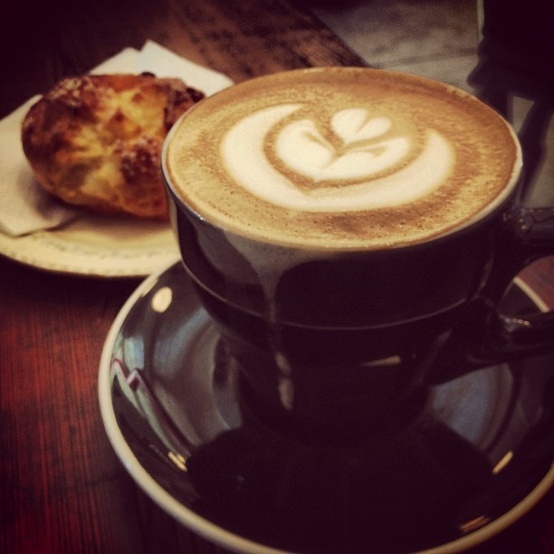 Last month I was in DVLB and saw Malcolm Gladwell, author and public intellectual, walk in for a cup of coffee. 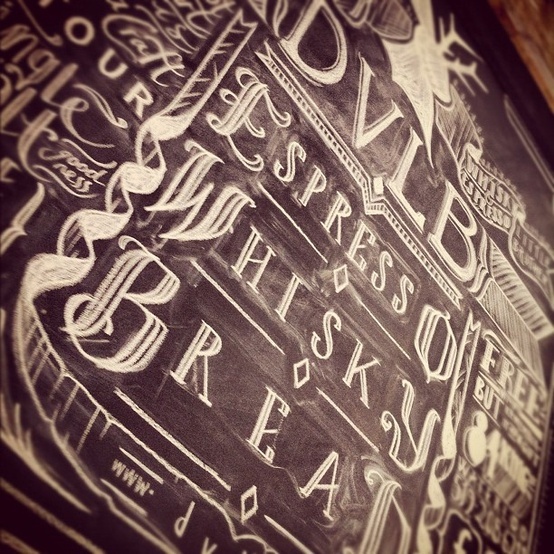 Cool NYC-hipsters know DVLB is the place to get a great cup of coffee in Waterloo Region.